My kids are amazingly tech-savvy. I shouldn't be surprised, since their father is a computer networking guru. I am not all that tech-savvy; I can use applications, and as long as they work as expected, everything is fine. As soon as something goes wrong, though, I call my in-house tech support. Since I'm not able to teach much about computer stuff beyond the basics, I've been thrilled to see more and more homeschool-targeted resources becoming available, and I jumped at the chance to review Kidcoder Web Series from Homeschool Programming. For the purpose of the review, I received an electronic copy of the Kidcoder: Beginning Web Design which included the student book and an installer program, which gave us all the pertinent documents. The program normally ships as a printed textbook and CD. 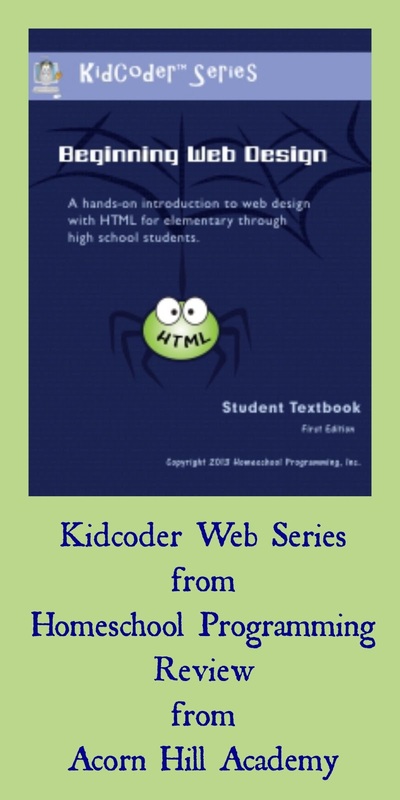 The KidCoder Web Series is a brand new product, released in May 2013. At the time of this review, only the first semester, Kidcoder: Beginning Web Design is available, but the second semester, Kidcoder: Advanced Web Design will be available in August. The Beginning program covers the basics of HTML, XHTML, and CSS. 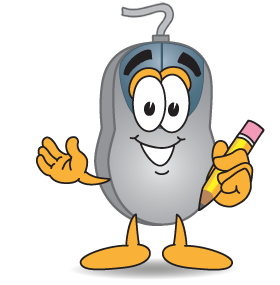 It's intended for students from 4th grade on through 12th grade with an interest in learning to build a website. It's expected that students will know the basics of using a computer; they should be able to select and open applications, use menus, and navigate the files on their computer (Windows Explorer on a PC; Finder on a Mac). They should have some experience with a text editor and an internet browser. The program uses software that comes free with your computer's operating system: TextEdit (Mac) or Notepad (PC) as a text editor, and Preview/iPhoto (Mac) or MS Paint (PC) for some photo editing. You do not have to purchase any special software to use this program. 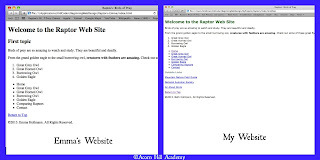 "We received the The KidCoder web design course electronically. The student book is a PDF, which worked beautifully for our family, as it went onto iPads and allowed for convenient access. There were included installers for Mac or Windows that would install the "Student Menu" and/or the "Solutions Menu" onto the computer; we have a laptop for the girls to use. The Student package includes all the html snippets to support the instructions in the book. These snippets were very helpful, saving typing and preventing a potentially large number of typos. The Solutions package contains some tests and answer keys, as well as solutions to the extra activities encouraged at the end of each chapter. Also included is the Solution Guide which helps get the teacher up to speed with the program and gives some very helpful hints. We recently went through a different programming curriculum with the girls, and this was a good follow-up to that experience. 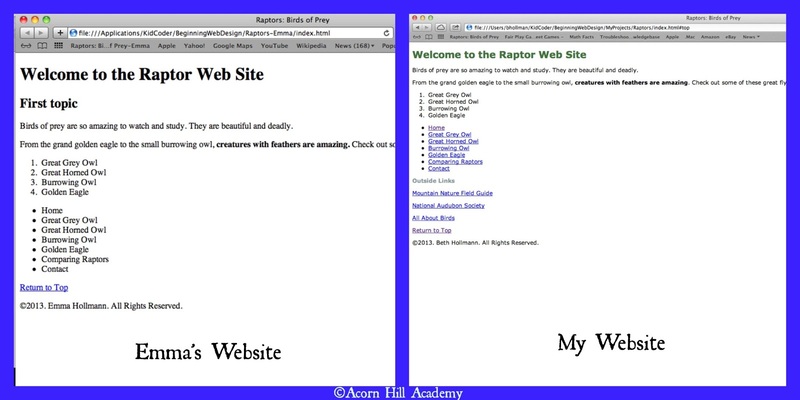 I worked through the book with the girls, slowly building a "Raptors" website as we progressed through the class. The instruction style in the book is to fully explain a concept and show examples, and then have a closing activity for each section to put what was learned to use. This reinforced the concepts that were presented, and I was very pleased at the speed at which things were explained. There was a logical progression of the building blocks of HTML. It was even good for some of us who once dealt with HTML but have been away from it for a while. I learned that some of my old HTML tricks *might* work, but there is a correct, standard way. For example, I used to use "br" in arrow brackets for a line break; now, standard practice is to type it as a closed tag. Who knew? For good reason, the program did not explain all versions of HTML, but stuck to HTML4, XHTML and HTML5, and was careful to point out what would work, versus a best practice to make sure your HTML would continue to function moving forward. And to prove you can teach old dogs new tricks I got to learn about CSS style sheets! I had seen them before, but never took the time to learn them. Now I have. The girls were able to do most of their work on their own, or get help from each other. A little to my surprise, the eldest seemed to grasp the concepts more quickly, and helped the younger one out. This was the exact opposite of the Logo experience, so obviously the artistic part of HTML caught the interest of the elder daughter. Yeah! The use of a single example website, and continuing to add functionality and styling to it through out the class was helped with the continuity. The girls built each new lesson on previous work, which kept the concepts fresh in their minds, and sometimes required them to review a previous chapter. I found this class to be a very good basic intro into HTML. It can seem slow at times, but the in depth explanations do help in the long run! I decided to work through the program myself, because I learned some very basic HTML about 14 years ago, but haven't worked with it much since. There have been... a few changes. As Todd mentioned above, I learned the same tag for a line break he did, but now, the standard requires all tags to be closed. I also learned that all tags must be typed in lower case letters; I learned to type them in all caps, because it set them apart from the rest of the text in your HTML document. I thought that change was a serious bummer, actually. The one thing I found difficult is there is a LOT of reading for this class. A 4th grade student would have to be very motivated, in my opinion, to read this much material. If I were working with a student that young, I would probably read it with them, and break it into small chunks. I learned a lot of great information: a little history of how the internet developed, how websites work, why it's good to know markup language rather than relying on design programs, etc. I breezed through the first 6 lessons, but when I got to chapter 7, we started digging into CSS, and I got very, very lost. I could not figure out what I was doing to save my life, so I didn't get any farther with my Raptors website. Just recently, the lovely folks at Homeschool Programming made the Instructional Videos available to reviewers, although they will not be ready for purchase until August - I found those to be extremely helpful, although I ran out of time to work on my website. I'm an audio-visual learner, and much prefer to learn while doing something. I would have liked more active things to do along the way, I think. Conversely, my older daughter *loves* to read and did very well with reading the student book and doing the exercises at the end of each chapter. My younger girl is normally the more logical, programming-minded child, but she really doesn't like to read to learn. She ended up getting quite a lot of help from her sister, and was angry about that - she's used to being the one to give assistance. Quote from Lesson One: "Working on web sites can be a lot of fun, but it can get very frustrating if you are not organized." Why, yes, it can! I know that my struggles with this program came entirely from my own lack of patience and attention to detail. I need to slow down and go back over some of the material; everything I need to know *is* in the book. Also, they offer free, personalized technical support for their customers; why I didn't take advantage of that, I don't know! I know I need to learn more about current HTML standards and CSS; it would be so helpful with my blog. 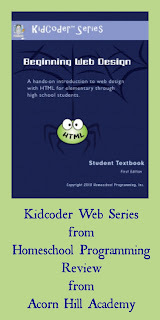 Kidcoder: Beginning Web Design is available from Homeschool Programming for $70.00. The videos will be available in August, for $20 when ordered separately from the main program, or a package price of $85 for both. Right now, through July 31st, you can use the coupon code HSB4015 to save $15 off any KidCoder or TeenCoder courses. Homeschool Programming offers many different products. Click to read more reviews from the Schoolhouse Crew, on KidCoder: Beginning Web Design as well as several other courses!